As the sun shone brightly, we could not have asked for a more perfect day to bring a busload of Green Patch Growers to CERES, a Community Environment Park located on the edge of the Merri Creek in East Brunswick. 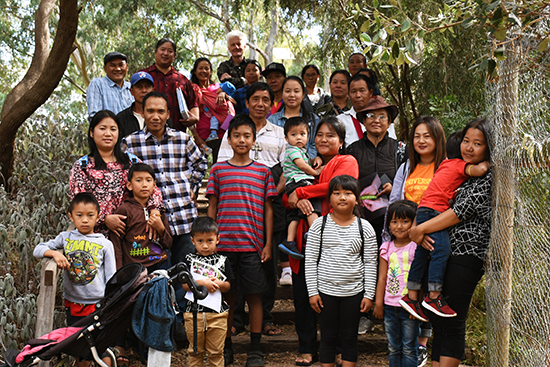 The Burmese families – refugees from Myanmar - had travelled from CatholicCare’s community garden project in Melton where they have been tending to their own crops on a pocket of land kindly donated by landowner, John Little. Today, they would hear about how CERES has grown from a small community garden project, to an award-winning sustainability centre that boasts education and training programs, a Nursery, Organic Market and Grocery, and a café. The children among the group were particularly interested in visiting the chickens while some of the adults were keen to understand how they could set up their own beehives. One grower shared how they would keep wild bees in the forests in Myanmar, using bamboo poles which they would hang vertically from the roof outside their home. We left the group enjoying lunch at the Merri Table Café; confident that they have picked up horticulture tips that they can use at their own vegetable gardens. The excursion to CERES was funded by a grant from New Hope Foundation; a MiCare organisation.